Get ready for panini-perfection. 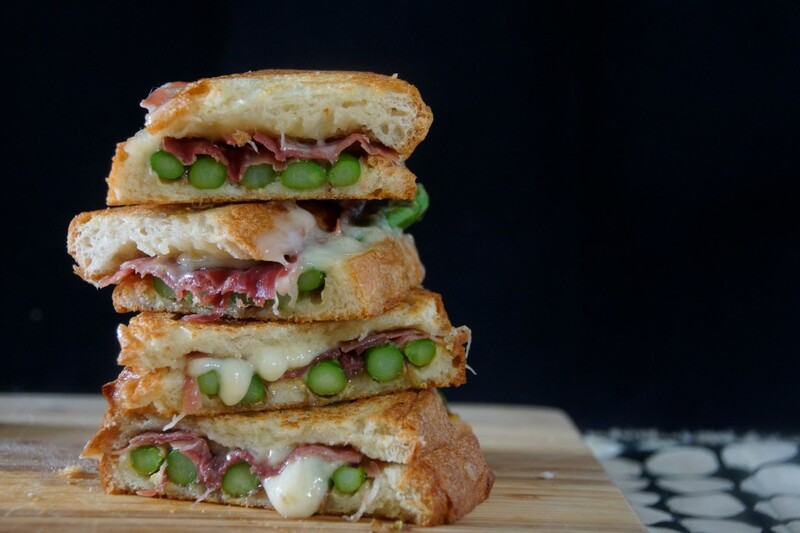 Grab a bunch of asparagus spears, a loaf of Italian bread, grated Fontina cheese, and few slices of speck. Do you know speck? Speck is, essentially, smoked prosciutto ham. It’s totally delicious, for the record, but if you can’t find it, regular prosciutto will still make a very worthy sandwich. We’ll give the asparagus a quick sauté and then assemble the panini. 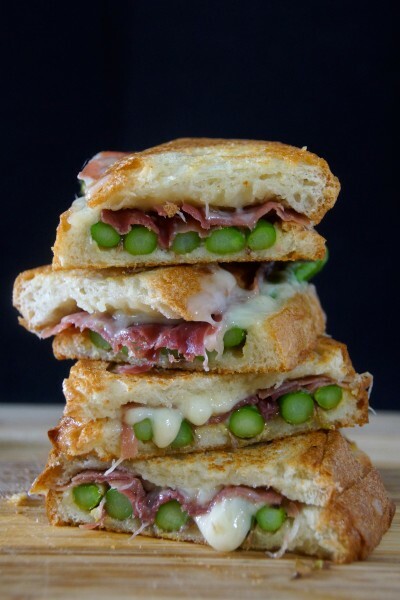 Give the bread a schmear of Dijon mustard (any sandwich involving melty cheese must involve mustard), artfully arrange the asparagus, sprinkle on the grated Fontina, and top with a couple of slices of the speck. Add a few more shreds of cheese to help the top slice of bread adhere and press. My preferred method of pressing? Put the panini in a buttered or oiled cast iron skillet and put whatever heavy object you have handy on top of the sandwiches. A foil-wrapped brick? Sure. A stack of frying pans? That’ll work. A toddler? Hmm…probably a good thing I don’t have children. Golden and just crispy enough. Take it out, slice it in half. Stack ’em up and get in there. See all this snow is a good thing. Without 8 inches of snow, we’d probably be looking at something boring like an asparagus salad. Who wants that, when there’s a sandwich oozing with melted cheese to be had? 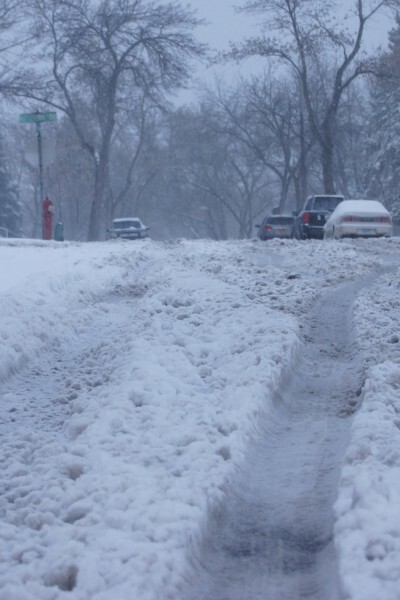 Let’s hear it for April blizzards. You don't need a panini press to make panini at home. Just put a couple of heavy pans or a foil-wrapped brick on top of your sandwiches and you'll achieve the same results without wasting cupboard space on another small, single-use appliance. Heat a little olive oil in a large, heavy skillet over medium-high heat and sauté the asparagus until it is crisp-tender. The time will vary greatly, based on the thickness of your asparagus. Mine was on the thicker side and took about 8 minutes. Season with salt and pepper and remove from pan. Assemble the panini. Spread a piece of bread with Dijon mustard. Place whole asparagus spears over the mustard. Sprinkle with grated Fontina cheese and top with 2 slices of Speck. Sprinkle with just a little more cheese (to anchor the bread) and place another slice of bread on top. Heat a small pat of butter and a drizzle of olive oil over medium heat in the skillet you used for the asparagus. Place the sandwiches in the pan and place something heavy on top of them. Press until the bottom of the bread is golden and the cheese is beginning to melt, about 5 minutes. Carefully flip and press on the other side until golden, about another 5 minutes. Or if you have a panini press, by all means, put it to use. Cut the panini in halves and dig in. Yay! Way to be positive, Sarah! This is tomorrow’s lunch! This weather, and your irresistible recipes, are wreaking havoc on my “diet”! Hmm…I like how you think! Oh wow, this looks like the best sandwich! I love that you don’t need a panini maker too, can’t wait to try this! I really hope the weather gets better for you soon. It was a really good sandwich–just look at that cheese!